4 Friendly Foods For Managing Ulcerative Colitis | Gastrointestinal Specialists, Inc.
Do you (or does someone you know) have ulcerative colitis (UC)? This chronic condition affects nearly 700,000 Americans every year, and while its cause is still unknown, chances are you’ve met someone with Colitis. UC is one of the more common forms of inflammatory bowel disease (IBD). Not to be confused with Crohn’s Disease, Colitis is characterized by inflammation of the large intestine, which can cause painful sores and ulcers in the digestive system. Currently, there is no known cure for Ulcerative Colitis, but don’t worry! One way many colitis patients manage their symptoms is through food. Since everyone’s experience with Colitis is different, there’s no single meal plan guaranteed to reduce symptoms. As a general rule, it’s a great idea to rule out foods that aggravate your symptoms as you notice them. Caffeine, alcohol, dairy products, chocolate, spicy foods, and foods that are high in fiber are all good ideas to avoid, as they tend to wreak havoc during a flare-up. Nuts, certain fruits/vegetables, and starches like whole-grain bread can all irritate the colon due to their high-fiber content as well. 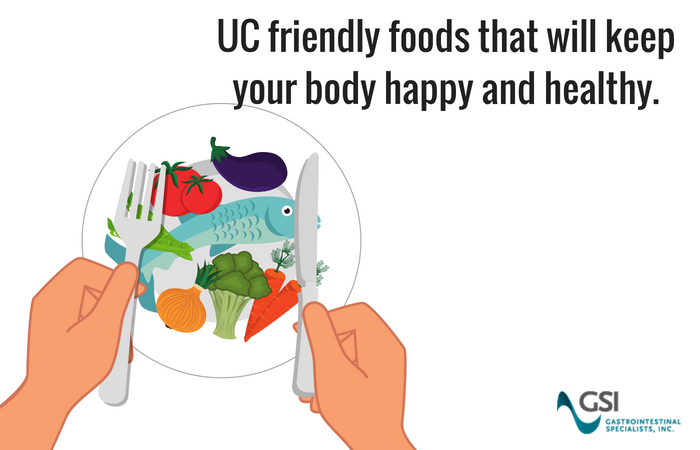 Since we know firsthand how difficult managing colitis day-to-day can be, here’s a list of UC-friendly foods to help keep your body happy and healthy. Squash is a versatile food containing all sorts of important nutrients for gut health. Not only is squash rich in antioxidants, but it also is a great source of vitamin C and fiber. Since raw squash can be harder to digest, roasting it is a great way to make squash more digestion-friendly. Plus, roasted squash works great as a side, in soups, or as a spaghetti substitute. Any type of squash will do! Yogurt can be a tricky food when it comes to digestive health. On one hand, yogurt is chock-full of probiotics, the healthy bacteria that regulate your digestive system. On the other hand, some yogurts, particularly ones with fruit, are high in sugar. Sugary yogurt can cause more frequent gas and diarrhea. Your best bet? Try some plain greek yogurt for breakfast or a snack to give your digestive system some love. Have no fear, salmon is here! Salmon is a great source of omega-3 fatty acids, which have been known to reduce inflammation. Swapping other proteins for salmon is a great way to promote digestive health, especially during a flare-up. Holy guacamole! Like salmon, avocados contain healthier fats that are good for your heart. Plus, avocados are full of nutrients your body colitis patients might miss out on when removing less flare-up friendly foods from their diet. Slice up an avocado and sprinkle with salt for a simple snack or addition to your next meal! Of course, food isn’t a cure-all for ulcerative colitis symptoms, but maintaining a healthy diet can certainly help manage them. Be sure to talk to your doctor (or schedule an appointment with us!) to find a nutrition plan that’s right for you.